Denver’s creative class is on fire, and it shows through the dizzying array of inspired restaurants and hotels popping up all over town. Opened in 2017, flaunts contemporary, emerging and established Colorado artists in every nook, down to the elevators. It’s worth a visit for non-guests, too. 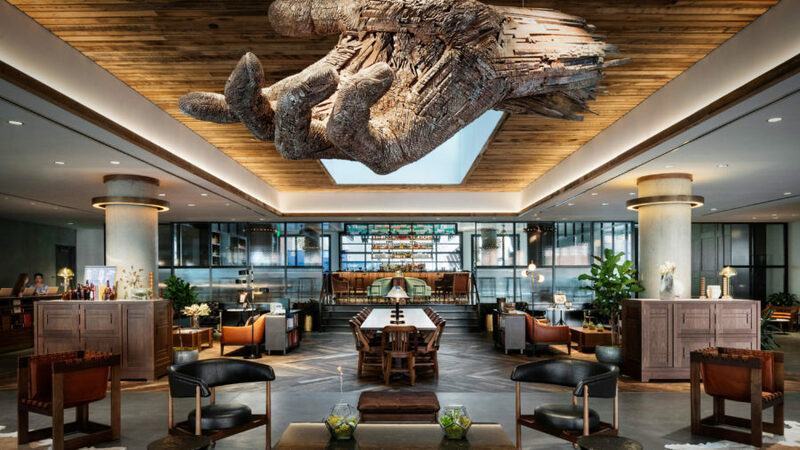 The lobby is chock full of artful communal spots, including a lounge canopied by a 500-pound, reclaimed wood hand sculpture; a gallery with rotating works; and a Southwestern joint with a 30-foot mural by Denverite Emanuel Martinez. 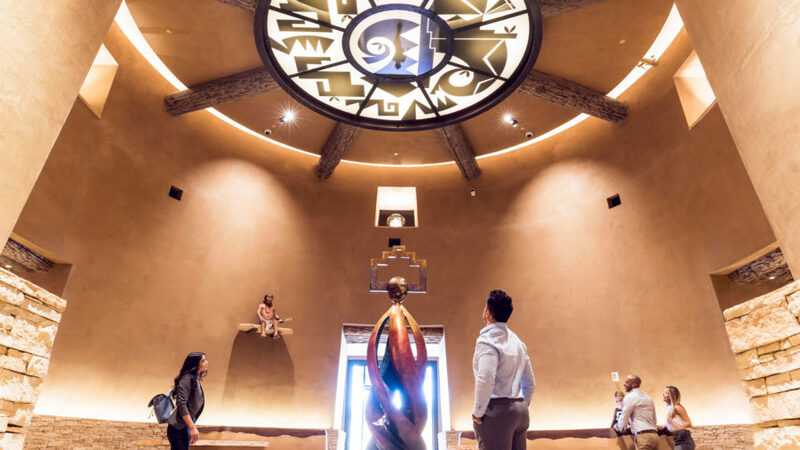 Like its sister property , which over the years has commissioned 34 Native American makers to kit out select rooms, the 2017-opened tapped regional talent to bring to life its design—an ode to historic Pueblo site Chaco Canyon. 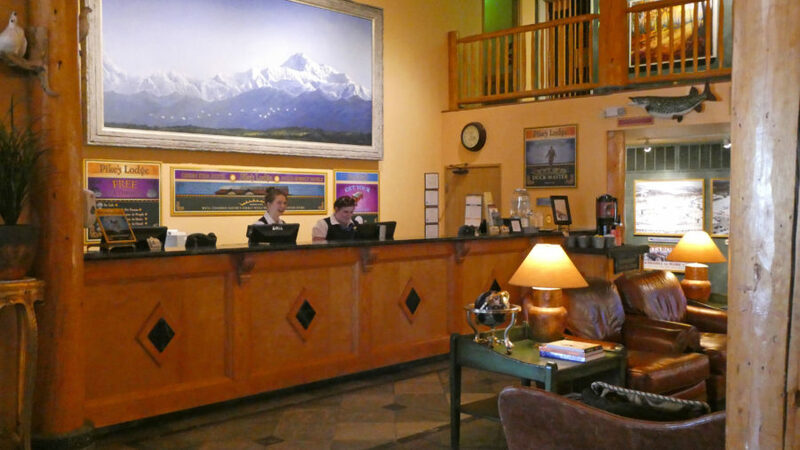 Different artists designed each floor, and the property features elements like hand-woven Navajo rugs, clay sculptures, paintings from artists such as Rhett Lynch and Marla Allison, and uniforms by designer Patricia Michaels. Get further acquainted with Native American contemporary stars at the in-house Gallery Chaco. Oregon-born, Pulitzer-winning photographer David Hume Kennerly’s black-and-white prints are the focal point at . The team worked with Kennerly to curate the largest collection of his work, which includes nostalgia-inducing images of U.S. presidents (a family portrait with George H.W. Bush giving Barbara Bush bunny ears, First Lady Betty Ford dancing on a table) and A-list starts (a playful headshot of Diane Sawyer, Hugh Hefner with his bunnies). The luminaries keep company with a roster of mostly Oregon artists like Gregory Grenon and J.D. Perkins, whose paintings and sculptures complete the decor. 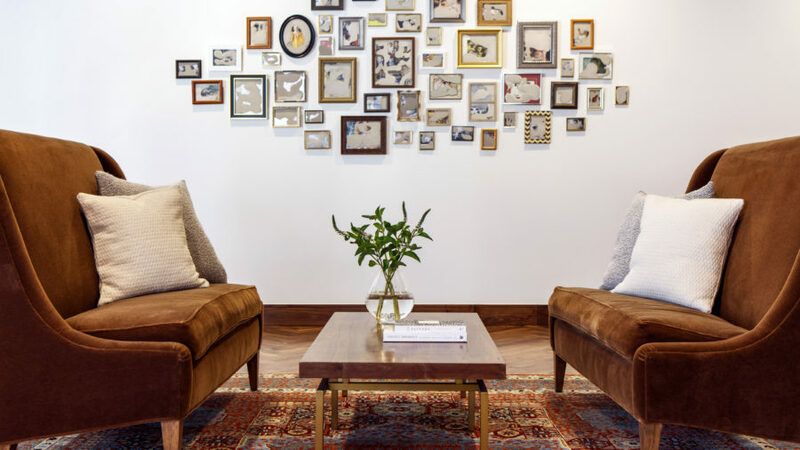 Pablo Sanchez-Navarro had one thing in mind when he founded this hotel in 2013: to make a space where artists would want to create. regularly hosts artists, muralists, musicians, and sculptors, who come to soak in the Baja magic in exchange for inspired works to color the space. There’s an underground recording studio, where Thievery Corporation and Brett Dennen have played; an idyllic private beach; and an Insta-worthy rooftop pool backed by a giant Stormtrooper. 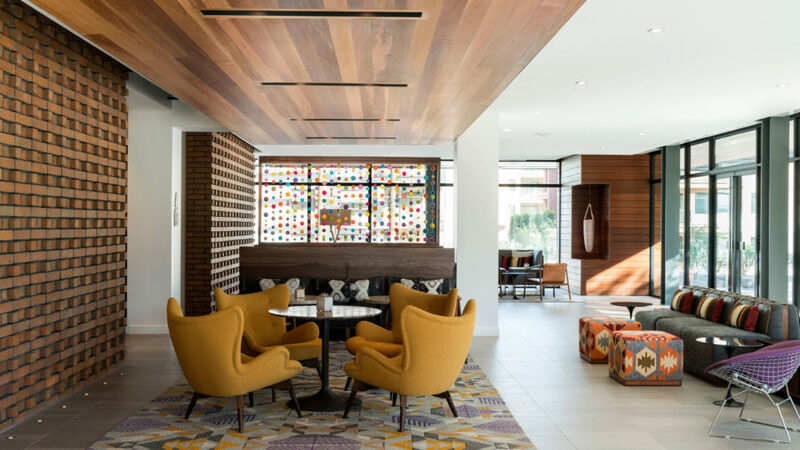 The hotel pours creative energy back into the community through its adjacent art center, which serves as an incubator for the talent of local kids. 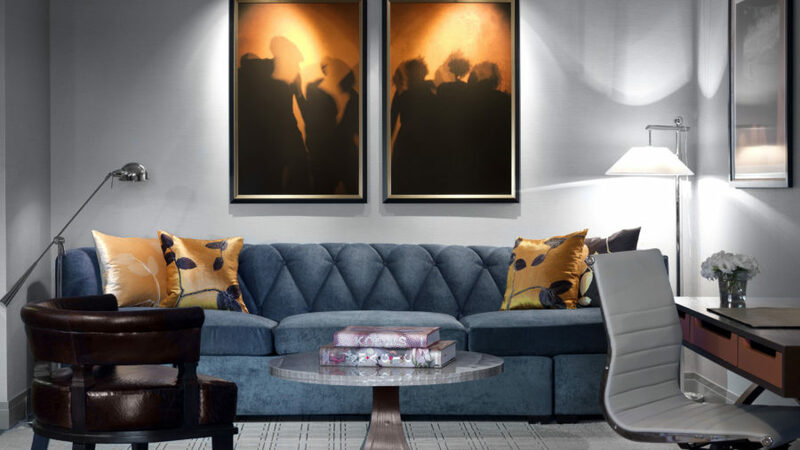 As the first hotel in West Hollywood’s snazzy Design District, set the bar high. Thanks to designer Gulla Jónsdóttir’s connections, the 151-room property reads like a primer on the who’s who of L.A.’s modern art circles: a poetry wall by Christopher Wilcox from Natural Curiosities here, a RETNA mural there, string installations by activist and fiber artist Tanya Aguiñiga upstairs. You’ll want to take everything home, so it’s a good thing designer-in-residence Jónsdóttir has also opened a studio gallery, stocking her furniture line and other L.A.-made sundries on the ground floor. 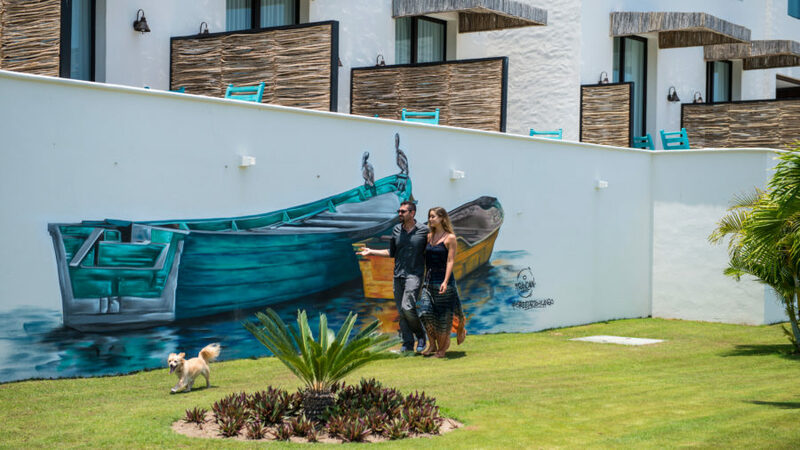 In a city where everything shines, manages to stand out with its mix of 600-plus works that turn a resort into a living exhibit. Digital art surrounds you on a walk through the lobby, a 2,000-crystal chandelier installation engulfs the bar, suites are outfitted with contemporary prints from Artspace—even Starbucks gets the creative-treatment with Georges Rousse’s illusionistic installation. Everything has a push toward the playful, like the cheeky mural local artist Mallory Dawn made using 3,000 plastic key cards the hotel had recently phased out; or the Art-o-Mat cigarette machines that pump out tiny works for a mere $5—a testament to the company’s impetus to make art accessible and enjoyable to all. 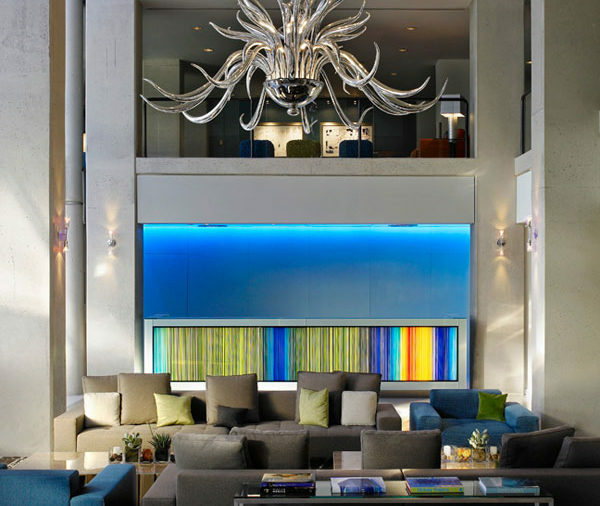 Right in Dale Chihuly’s hometown stands this sleek pad celebrating the Northwest’s leading role within the modern glass art scene. With its mix of collected gems and site-specific works—like a 75-foot-tall, outdoor sculpture by Costas Varotsos—the has become a city landmark. Each of the 25 floors is dedicated to a glass-art wonder, from artists like Massimo Micheluzzi and Dane Vibeke Skov, and behind-the-scenes sketches and images of the piece lining the hall. The theme continues in the rooms with hand-blown lamps made in Portland. 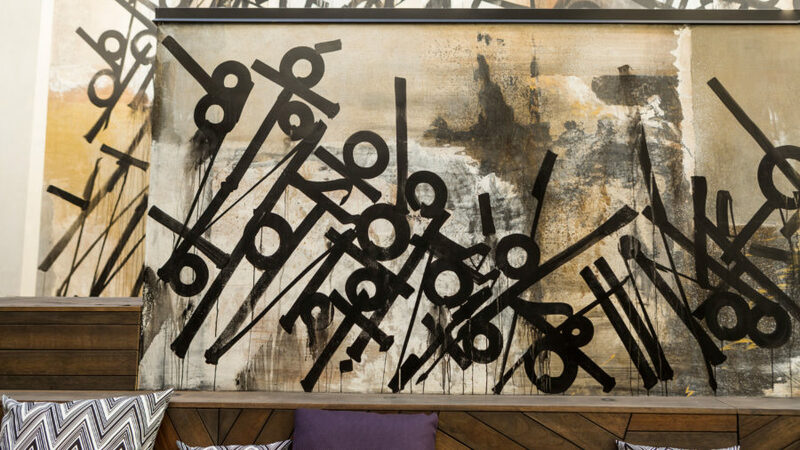 Though the look and feel of this vineyard and inn recalls a villa in Tuscany, owner Douglas Ayres didn’t limit himself to any country or genre when selecting the 100-plus artworks and artifacts that populate the 20-acre . With a range spanning from a naturally-occurring concretion mined in France to an Indian Siddhartha statue to paintings by local artists, Ayres, who studied religion and music in college, aims to promote harmony and surface parallels between cultures. The new art and wine tour, Fridays and Saturdays at 4 p.m., combine two of the luxury resort’s strengths. 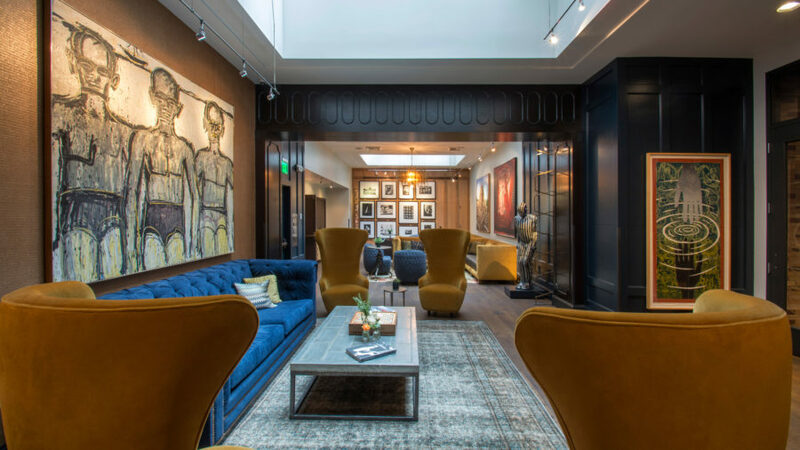 Kimpton’s opened at Union Station in 2017, adding to the meteoric rise of the neighborhood’s design-forward revival. Curator Adam Lerner from the Museum of Contemporary Art Denver (MCA) commissioned 32 Denver artists to create the 700 one-of-a-kind works seen onsite. “Our owners are big art lovers,” says manager Von de Luna. “They want to provide local artists with the platform and budget to do what they do best and show off the talent in our community.” Want more? Born guests can visit MCA, down the street, for a mere $1 admission fee. Opened in 2017, the desert-cool offers a perfectly curated snippet of modern, Southwestern design. Makers from the Cattle Track Arts Compound (an artist colony that existed before Scottsdale was even a city) filled all 201 casita-style rooms and public spaces with handmade ceramics, folk art, and contemporary installations. Cattle Track’s stamp carries through to the littlest details, like the printed keycard slips and the restaurant bar stools etched with the craftsmen’s names. The partnership goes beyond the physical realm, too, with weekly art classes and concerts for guests. 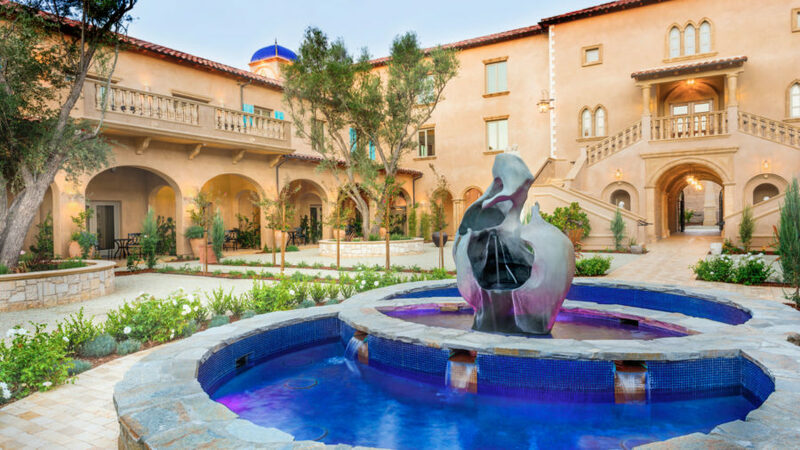 Twice a week, docents lead tours of the 40-acre —a Waldorf Astoria resort endowed with prized works from the likes of Fernando Botero, Picasso, and Fernand Léger (including the only complete Léger bronze collection outside his own museum in France). 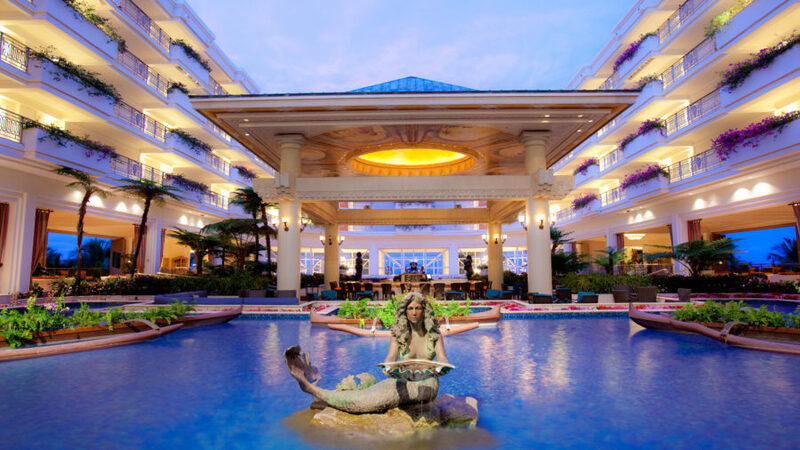 Island talent is also on deck—look for the Wailea Mermaid carved out of a single piece of wood by Maui’s Dale Zarrella, and a statue of King Kamehameha I by Living Treasures of Hawaii-recognized artist Herb Kawainui Kāne. The building is a work of art in itself; from the sky it looks like a turtle emerging from the sea. Alaska has long drawn adventurers and naturalists seeking to capture its wild beauty on canvas. Fairbanks native Jay Ramras elevates regional masters at his . Hidden in plain sight at the family-friendly resort, you’ll find Rusty Heurlin dreamscapes capturing Athabascan heritage, irreverent Last Frontier scenes by Harvey Goodale, as well as some modern paintings by living artists like Randall Compton. Over the past 18 years, Ramras has acquired more than 100 Alaska paintings that are on par with the kind of exhibits you’ll find at the reputed University of Alaska Museum of the North, nearby.